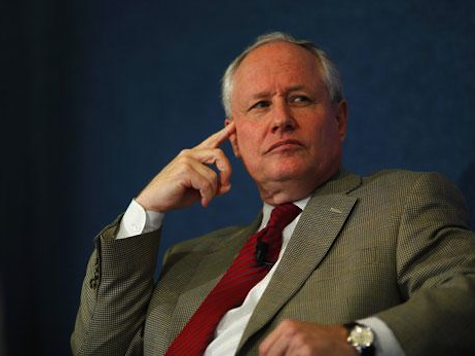 Bill Kristol, editor of the Weekly Standard, is looking for someone to whom to surrender. And so is much of the Republican establishment, so desperate to hold onto positions of influence that they are willing to abandon the newly-confirmed House majority and a bedrock Republican principle for the last two decades. Giving in on Obama’s tax hikes would not win many votes. But it would certainly end the GOP as a viable opposition. Kristol has embraced a policy that is nothing more than a left-wing, soak-the-rich meme. It would not close the budget deficit; at best, it would reduce the annual $1 trillion-plus deficit by 7 cents on the collar. Raising taxes would, however, hurt investment and punish success. And Republicans have been burned before by agreeing to deals in which Congress hikes taxes and the promised spending cuts never materialize. The point here is not to protect “millionaires.” (We conservatives call many of them small business owners, in case Kristol’s forgotten.) It is partly about protecting the economy. But it is also about preserving a check on the Democrats’ power, which is no greater today than on Nov 5. What House Republicans did in opposing the stimulus in 2009, unanimously and as a minority, they must now do on taxes as a governing majority. If not, there is little else upon which Republicans will deserve to be trusted, by their own voters or by anybody. The same electorate that returned Obama to office also opposed tax increases to reduce the deficit by nearly a two-thirds majority, according to exit polls. A minority–47%–favored higher taxes on the rich. The position Kristol–and Obama–advocate is not what the public wants or what it gave Obama a mandate to achieve. Kristol has certainly come a long way from being one of the early advocates of Gov. Sarah Palin to being the star witness for the Democratic Party. Recall that when the Obama campaign made an issue out of Mitt Romney’s tax returns, it was Kristol, among others, who joined the chorus. Kristol also said it was “weird” that Romney paid lower tax rates than many Americans, joining Obama’s class warfare bandwagon. That formed part of the negative barrage which put Romney off limits to voters in swing states. Luckily, the Republican minority spurned such capitulation. Why should the GOP have less courage now as a majority party, with a popular mandate? Why should it have less courage now as a majority party, with a popular mandate? If Kristol wants to give in on taxes, let him follow the advice conservatives have given to the likes of Warren Buffet. Let him write a check to the federal government to prove his commitment to higher marginal tax rates. As for he rest of us–we strivers hoping to join Kristol’s tax bracket, we conservatives who understand the importance of opposition in our Republic–we intend to vote out those who dare to force us to follow his lead.